This is one of my absolute favorite salad recipes. It tastes phenomenal, but I think I mostly enjoy it so much because it’s something a little different. 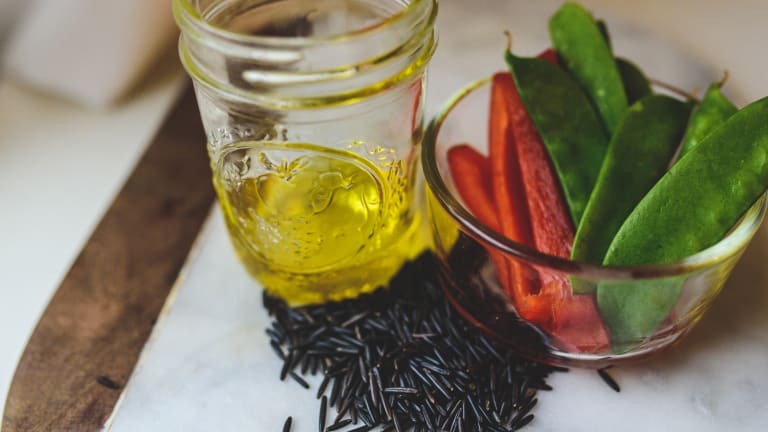 If you cannot find wild rice, I recommend using a wild rice blend. You could add cooked chicken or pork if you would like. Also, cook the rice the night before for easy prep at dinner time! Paleo: Use cauliflower rice instead of cooked wild rice. Omit sugar from dressing. 1. Rinse rice. Add water to a medium saucepan and simmer for about 45 minutes, until rice has burst slightly (according to package instructions). 2. Whisk together dressing ingredients in a small bowl or glass measuring cup. 3. When rice is done, rinse in cold water to chill, then toss with lemon juice in a large bowl. Add the vegetables and toss with dressing. 4. Cover and refrigerate until ready to serve (it’s best if it can refrigerate for 2-4 hours or more, but serving right away is fine too). Add pecans just before serving.